Architecture & Design looks at five ways integrated or architectural solar panels are being integrated into a building to harness the sun's energy. Harnessing solar energy is not really anything new. We all see the solar panels sitting on houses. However, the way solar energy is harnessed is changing. Chucking a few PV panels on the roof no longer cut it. Solar panels need to be sleeker and more integrated, no longer looking like a garish addition to a well-designed building. Architecture & Design looks at five roofing-based integrated solar solutions for buildings. We first saw these in a recent article from Inhabitat. But it turns out the glass roof tiles which actually heat your home with solar energy have been around for a few years now. Swedish company SolTech Energy developed the unique heating system. Tiles are made from ordinary glass and weigh the same as normal roof tiles. Tiles are installed on top of black fabric, which absorbs the heat from the sun. Air slots are located under the fabric allowing the tiles to heat up clean air. This warm air is then used to heat up water, which is connected to the house’s heating system. The system generates around 350kWh heat per square metre, dependant on factors such as climate, roof angle and house direction. And although no Australia companies stock these gorgeous tiles, the tiles can be purchased through the SolTech website. It even offers world-wide shipping. Both Monier and Tractile offer integrated solar roof tiles in Australia. 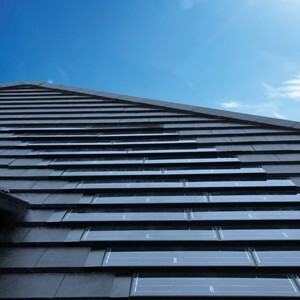 Monier developed its SOLARtile to be integrated seamlessly with normal roof tiles. It works exactly the same as a conventional PV panel, but isn’t bolted on top of traditional roof tiles. One of the first building integrated photovoltaic (BIPV Australia) roofing products of its kind in Australia, the SOLARtile was about maintaining the look of a home while also cutting costs on electricity. It has a power output of 30Wp during peak wattage and 120 Wp per square metre. Tractile Interlocking Roof Systems utilise interlocking tiles, which weigh less than 25% of standard concrete roof tiles. Tractile won a Design Award for Sustainability in the 2013 Australian International Design Awards as well as a Best in Category for Hardware and Building. It won the award for being “a game-changing alternative to concrete roof tiles and existing solar panel units often considered an eyesore". Windows are notorious for being a weak spot for energy inefficiency in buildings, but what if they could be the solar panel as well? Pythagoras Solar have developed a photovoltaic glass sheeting unit or PVGU, which is a transparent solar panel using standard monocrystalline PV cells that work with the sun, generating energy for the building after installation. Visible light is diffused through the windows while the direct sunlight is collected in the photovoltaic strips, which helps prevent heat gain from the sun. This technology is already in use, with the Willis (Sears) Tower in Chicago utilising the solar windows. Although the Pythagoras technology is not yet available in Australia, Solar Choice offers an in-house architect and consultant to design BIPV solutions. They came up with a way of ‘printing’ colourful glass that can generate electricity from the sun. It works by adding a layer of transparent solid-state solar cells at most three microns thick to conventional glass. The power can be exported to the national grid or used to run the building. Currently the best technology is not available for use, but the company is growing quickly. It is expected full-size panels will be ready for sampling and trials by the end of this year and expect first revenues by 2016. While they will mostly be targeting new buildings, there is considerable interest by the company to retrofit the facades on existing buildings. Already developments are happening with the idea of being able to ‘paint’ solar cells on to surfaces. The University of Sheffield and University of Cambridge claim they have succeeded in developing solar cells which can be sprayed onto surfaces, and potentially in the future, buildings. Additionally, New Energy Technologies has developed a transparent solar window coating called SolarWindow. The coating uses some of the world’s smallest functional organic solar cells, measuring less than a quarter of the size of a grain of rice. It can be sprayed onto see-through glass, which can then generate electricity.